Zeitgeist Northwest will present the 8th Annual Portland German Film Festival October 6 – 10, 2017 at Cinema 21. Our annual festival showcases feature films, documentaries and short films that represent the state-of-the-art in German film making. We are also delighted to include films from Austria and Switzerland to give our audience the chance to experience the diversity, history and progress of German-speaking countries in Europe. All films are shown in German with English subtitles to allow a broad audience access to these German-language movies. Film is a dynamic medium with the power to educate, inspire, intrigue and bring people together. Now in its 8th year, the Portland German Film Festival continues to offer thought-provoking and entertaining German language cinema to the U.S. Spanning first-releases, dynamic documentaries, up-and-coming new artists to wonderful children’s fare, and classic films. The festival offers something for everyone. Pacific University is hosting a francophone film festival in October and November. Films will be screened in the Forest Theater in Forest Grove. Films are accompanied by pre- or post-screening discussion with Pacific faculty. The films are free and open to the public. Ability to teach Spanish as well would sweeten the deal. Thanks to all of you who participated in last Wednesday's state advocacy call! Watch the recording or download the slides. If you weren't able to join, we shared several critical actions you can take right now! Are you already a seasoned activist? Try this out! Send a message to encourage full funding for ESSA, Title IV grant money to your representatives using ACTFL's pre-written letter tool. Share this letter writing tool with friends! Want to share a state advocacy accomplishment? Have a question? Need help with the Seal of Biliteracy program? Have a legislative update or tip to share? Email Trey Calvin, Program Coordinator. Thanks for all your continued efforts! How does language learning influence economic growth, cultural diplomacy, the productivity of future generations, and the fulfillment of all Americans? What actions should the nation take to ensure excellence in all languages as well as international education and research, including how we may more effectively use current resources to advance language attainment? In response to this request, the Academy created the Commission on Language Learning. 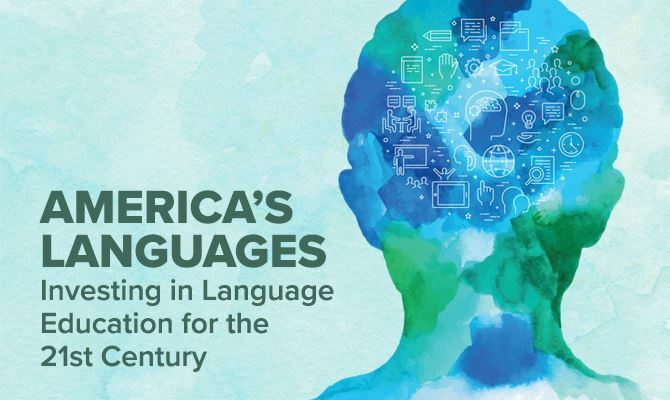 The Commission’s final report, America’s Languages: Investing in Language Learning for the 21st Century, offers concrete recommendations to improve access to as many languages as possible, for people of every age, ethnicity, and socioeconomic background. Oregon Episcopal School is seeking an experienced, innovative educator to teach Mandarin language and Chinese culture in its Middle School. This individual will teach sixth, seventh, and eighth grade Mandarin with the possibility of an additional section of Mandarin I in the Upper School as needed. This teacher will collaborate with the World Languages Department on articulating a scope and sequence for Mandarin education at OES and will support Upper School Mandarin language trips. APPLICATION PROCESS: Please visit the OES website at http://www.oes.edu to learn more about the School and its programs. Interested candidates should forward cover letter, resume, and completed application, to the attention of Middle School Division Head Ann Sulzer at sulzera@oes.edu, or Oregon Episcopal School, at 6300 SW Nicol Road, Portland, OR 97223. Open until filled. No phone calls please.